Steel guitarist Alan Akaka took the stage last week at the Waikiki Beach Marriott Resort with Genoa Keawe, left, and Momi Kahawaiola'a. Akaka and four other steel guitarists will play at Hawaii Theatre on Friday. Opinions differ on why the Hawaiian steel guitar isn't as prevalent in island music as it used to be, but there's little disagreement that "steel" is heard less often than the other three instruments that have been the foundation of local music for the last century. There's been a tremendous resurgence in slack-key guitar since the '70s, the old-style Hawaiian "stand-up" bass has a place in many groups these days, and the ukulele seems to be everywhere. Steel guitar is harder to find. Even on an institutional level there's a difference. The Hawai'i Academy of Recording Arts created a Ki Ho'alu award for slack key in 1991, but has no comparable award for steel guitar. All things considered, the timing couldn't be better for Burton White's "Be Steel My Heart," featuring five steel guitarists. It's the final show of White's 2006-2007 "Hana Hou!" concert series, and it features Alan Akaka, Jeff Au Hoy, Casey Olsen, Eddie Punua and Greg Sardinha. Akaka, senior member of the group, says that although steel guitarists don't get the exposure of ukulele players and slack-key guitarists, "There are more steel guitars out there than there were a few years ago." The Halekulani has been presenting traditional Hawaiian and hapa-haole music with steel guitarists on the lawn at the House Without a Key since it reopened in the early '80s, Akaka reminds us. He was also happy to find Sardinha and a group of musicians playing at the airport -- "steel guitar, guitar and string bass. It was nice to hear." 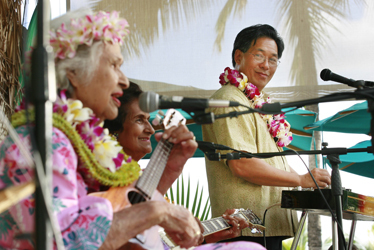 Akaka plays with Genoa Keawe at the Waikiki Beach Marriott Resort from 6 to 9 p.m. on Thursdays. It doesn't get much more Hawaiian than Keawe singing traditional Hawaiian falsetto with her son, Gary Keawe-Aiko, on acoustic bass and Akaka on steel guitar. "Aunty Genoa always has steel guitar, and there are some other little clubs here and there where somebody like Jeff Au Hoy will go and play with various groups, but I can't say that (even) 10 percent of the clubs around here feature steel guitar with the groups." Greg Sardinha, who has performed at the airport, can play rock on his steel guitar. Akaka says most of today's steel-guitar players aren't looking for a lot of public exposure, let alone a career. "It's not the money, it's just (that) they enjoy doing it and they want to play." "I like to play simple and straightforward in the traditional Hawaiian style. Bobby (Ingano) is the smoothest. Greg (Sardinha) can take a steel and play rock. Casey has a jazz approach, he can be playing a Hawaiian song and get right into jazz." And then there's Au Hoy, the youngest by a decade and still in his 20s, who taught himself the basics by playing along with old records, and who bought his first instrument on eBay. Au Hoy isn't the only one of his generation poised to follow Akaka, Ingano, Olsen and Sardinha as a major player, but he is the most visible. Au Hoy was already a welcome guest at Keawe's weekly show when the Brothers Cazimero introduced him as their May Day guest at the Waikiki Shell in 2003. His credits since then include work with Aaron Sala, Kilinahe and Hoku Zuttermeister. "He's doing incredible things with steel guitar. His playing reminds me of (the late) David Kelii," Akaka says, referring to one of the great steel players of the Territorial Era. Kelii was one of the stars of "Hawaii Calls" and an inspiration for steel guitar fans in many parts of the world. Kelii and the other greats of his generation are long gone, but with Akaka and others still playing, recording and teaching, the tradition is in good hands. Maui's "Masters of Hawaiian Slack Key Guitar" began this week and runs through Dec. 19, with concerts at the Napili Kai Beach Resort. 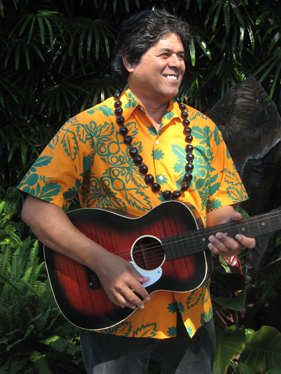 The concerts take place on Wednesdays at 7:30 p.m. with master slack-key player George Kahumoku Jr. as host. They feature renowned slack-key players (next week will showcase Ledward Kaapana), as well as artists in traditional Hawaiian music such as ukulele and steel guitar. Recordings of the concerts won the Grammy Award for Best Hawaiian Album in 2006 and 2007. The series has been held since 2003, until this year at the Ritz-Carlton Kapalua, which is under renovation. Tickets are $45, with discounts for kamaaina. Call (888) 669-3858 or visit slackkey.com.